Chris Arcidiacono (15) shooting for Neshaminy against Lincoln. Chris Arcidiacono watched his older brother, Ryan, compete for four years at Villanova and win a national championship, and often wondered if the day would come when he could wear that same jersey. The younger Arcidiacono fulfilled that dream on Friday when he announced on Twitter that he had committed to the Wildcats. The 6-foot-3 former Neshaminy High School star, who played a post-graduate year at the Perkiomen School this season, said Friday he received Villanova’s scholarship offer “about a week or two ago,” and called it “one of the happiest moments of my life. And to the entire Arcidiacono family, according to his older brother. “His dream school has always been Villanova,” said Ryan Arcidiacono, who just finished his season with the Chicago Bulls playing in 81 games with 32 starts. “I’m sure watching me play there and having my parents go there as well, it’s been a school that he’s always wanted to go to. 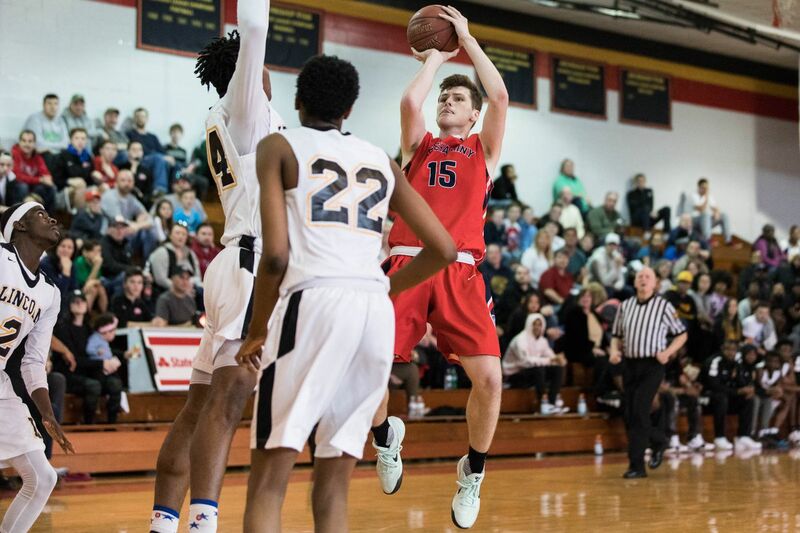 Chris Arcidiacono said he spoke with his father and his brother about taking a year after graduating from Neshaminy to improve his game before going to college. He credited his coach, Thomas Baudinet, and the support system at Perkiomen School for his improvement. He said he received interest from La Salle, Wake Forest, Davidson and St. Joseph’s. When the offer from Villanova came, that clinched it. Arcidiacono averaged 20.0 points, 6.4 rebounds and 4.7 assists for the Perkiomen School and led the team in three-point percentage at 41.9. Last season, he earned second-team All-State honors after averaging 26.4 points for Neshaminy. He scored a District 1 record 51 points in a PIAA playoff game. Ryan Arcidiacono, who played at Villanova from 2012 through 2016, holds the program record for most starts with 143 and finished his career with 1,604 points (22nd all-time) and 535 assists (fourth). In his final game, he made the pass to set up Kris Jenkins’ game-winning three-point basket that gave the Wildcats the national championship. So the comparisons will be coming, and some will be unfair, but the younger Arcidiacono said he is used to it.